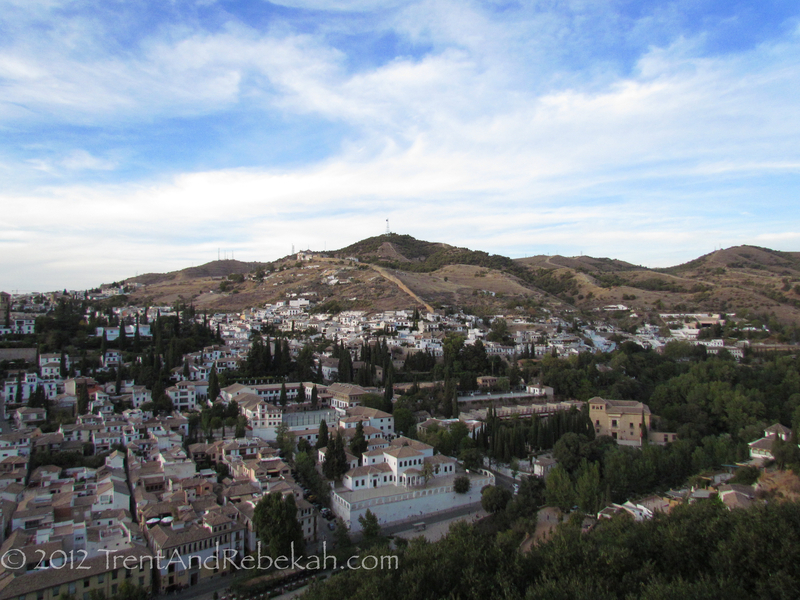 We spent yesterday in the city of Granada, Spain and centered our time around the exquisite Alhambra. 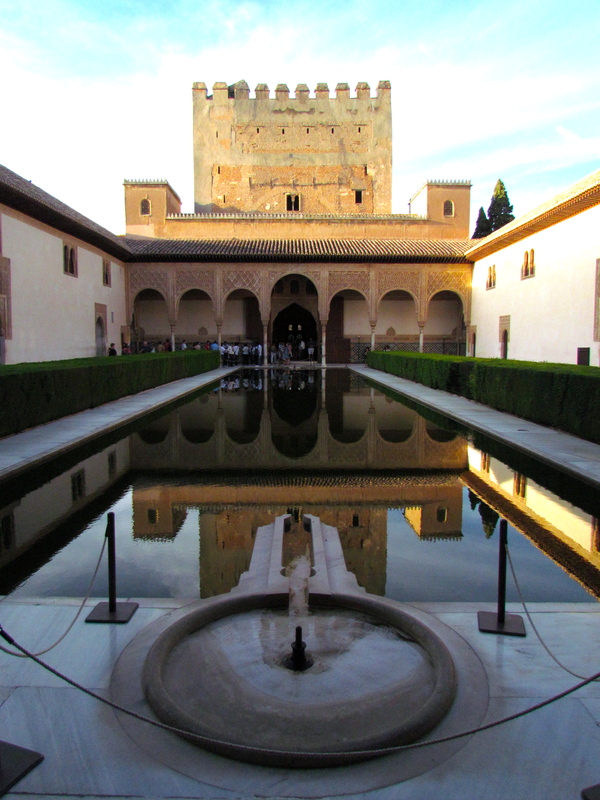 The Alhambra was the king’s palace in Granada. It contains all of the intricate architectural details of the Moorish style: horseshoe arches, stalactites, vibrant colors, and the geometric tiling that showcased the Moor’s mathematical prowess and inspired artist MC Escher. 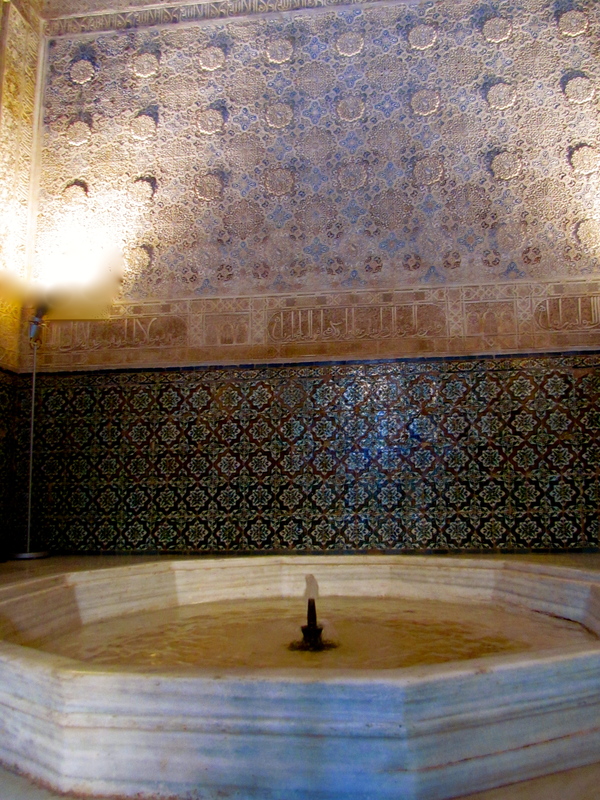 But the main decoration at the Alhambra is water. In the arid lands of Islam, water was life and wealth–a precious commodity. As all kings since time in memoriam, the sultans flaunted their riches and thus, here, threw water away on plants, ponds, and fountains like it was just dust. The centerpiece of this palace is known now as the Patio de Leones. 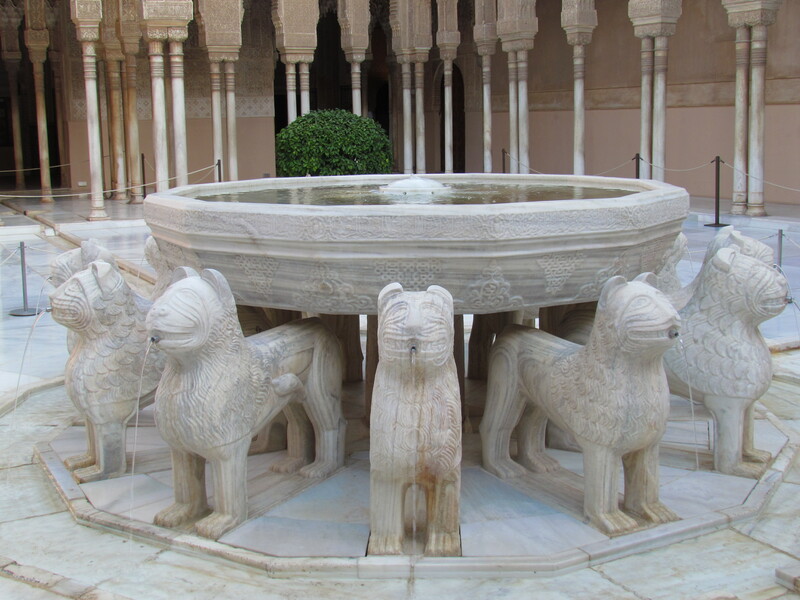 The Jewish community got along quite well with the sultans, and presented them with the huge and beautiful lion fountain, a large basin resting on the backs of 12 lions (representing the 12 tribes of Judah). This brings to mind another Jewish symbol–Solomon’s molten sea, a great basin resting of the backs of graven oxen (II Chronicles 4:2-5). Off of this court is the Hall of the Abencerrajes, the sultan’s living room. Boabdil’s father once took a new wife and wanted a new heir through her. To achieve this, he decided to cut off the children of his first marriage. Quite literally. At one time, he had 36 heads piled in the room’s fountain. The savage brutality is shocking now, though commonplace then. But, sic simper tyranus; his plan failed and Boabdil ascended to the throne. There were many other interesting niches and corridors here. One door would lead to a 1200 AD bathroom with full plumbing, the one directly across from it led to the harem. Insets in the wall face Mecca for prayer. Windows peek out at the white-stucco city or the luxurious gardens inside the walls. And everywhere is heard the lush gurgle of water from fountains, pools, and irrigation tunnels. This entry was posted on September 18, 2012 at 1:34 pm and is filed under Ancient History, World History. You can follow any responses to this entry through the RSS 2.0 feed. You can leave a response, or trackback from your own site. You all are blowing me away with all these amazing facts and photos. I feel like I am in a tour guide pamphlet! 🙂 Very interesting! Glad you like it….we’re having fun doing it! It has been more fun to keep up with the trip this way. We’re really looking forward to the alps! Looks like you are having a great time. It was back to work for me today :-). Delighted to see all of your comments and photos. 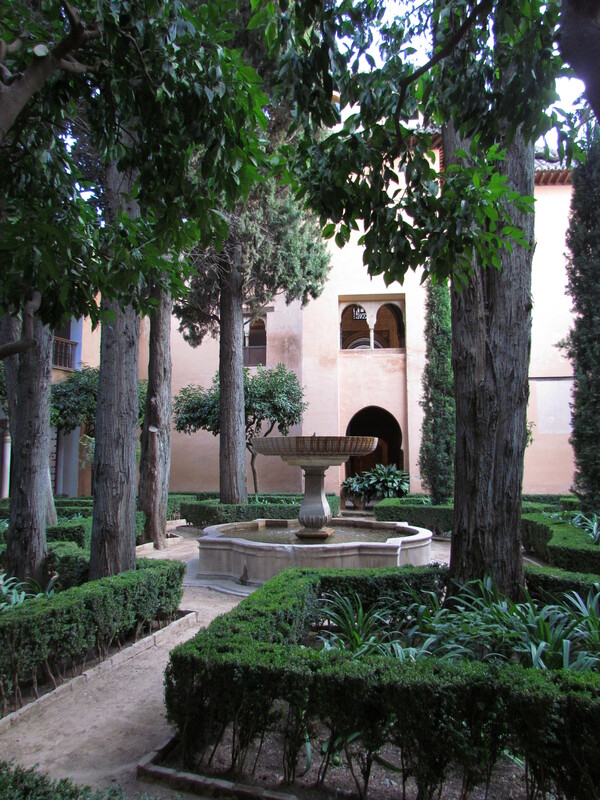 Especially pleased to have a good photo of the Patio de Leones. The last time I was there was in the early days of digital photography. We just walked in the house less than an hour ago after an addition great week in Israel. Keep having fun, learning, and sharing. Glad you and Elizabeth returned safely. We both immensely enjoyed our time in Israel with you (and Elie :). We now have lots of good information and pictures to review and distill into teaching material and such. Also, glad we could provide a useful photo!